A.Visiting www.hitsnow.com (the “Website”) and following the instructions including filling in all requested fields on the entry form including a valid email address and submitting to receive one (1) entry into the Sweepstakes. 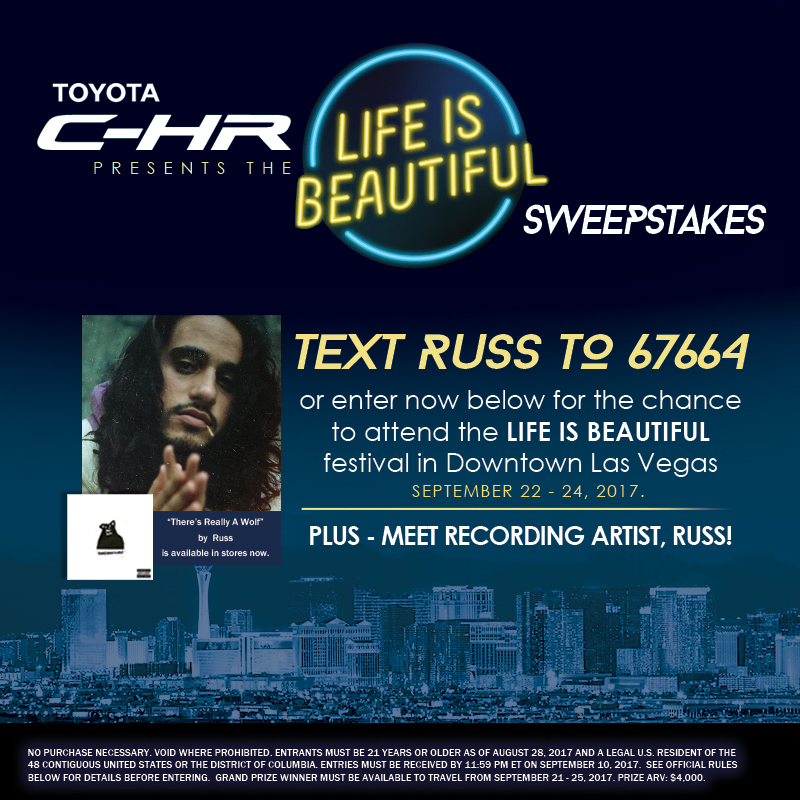 B.You may also enter by texting “RUSS” (one word) to 67664 to receive one (1) entry into the Sweepstakes. You agree to receive up to two (2) autodialed reply messages per entry if you enter via this entry method. You may opt-out by texting STOP to 67664 to stop (you will be sent a confirmation message). However, if you opt out before the end of the Sweepstakes Period, your entry may be void. Standard data and message rates may apply; refer to your carrier contract for more details. Entrants via this entry method are solely responsible for any such charges.Not all wireless service providers participate. Wireless text message or phone service may not be available in all areas. Your mobile phone must be capable of sending and receiving multimedia messages to participate via this method.Proof of sending or submission or a text message will not be deemed to be proof of delivery or receipt by Sponsor. Any method of entry other than the foregoing is void and will not be honored. The Sweepstakes is sponsored by Toyota Motor Sales U.S.A., Inc., 19001 S Western Ave, Torrance, CA 90501(“Sponsor”) and administered by Westwood One, Inc., 220 West 42nd Street, New York, NY 10036 (“Administrator” or “WWO” and with Sponsor, collectively, the “Parties”). The Sweepstakes is subject to these official rules. By participating, entrants agree to be bound by these official rules and the decisions of the Parties, which shall be final and binding in all respects. Entrants receive a chance to win a four (4)-night trip to the Life is Beautiful festival in Las Vegas, Nevada as described in more detail in Section 5. Travel must occur between Thursday, September 21, 2017 and Monday, September 25, 2017 and travel must be booked within seven (7) days of being named the Winner (as defined below). No responsibility is assumed by the Parties for any technical malfunctions that may occur. Only one (1) entry per physical address, e-mail address, cell phone number, or person is allowed.If multiple Internet or text message entries are received from the same physical address, e-mail address, cell phone number, or person, only the first entry received from that physical address, e-mail address, cell phone number, or person will be accepted.No mechanically or electronically reproduced entries are allowed. The use of automatic devices for entry is not valid and may result in disqualification. You must complete and submit all required information to be eligible to enter to win. The Parties are not responsible for entries not received due to difficulty accessing the Internet, service outage or delays, computer difficulties or other technological glitches or for incomplete, illegible, corrupted, or untimely entries, which will be voided and disqualified. All entries will be deemed made by the authorized account holder of the e-mail address or cell phone number submitted at the time of entry. The “authorized account holder” is the natural person who is assigned to the e-mail address by an Internet access provider, online service provider or other organization that is responsible for assigning the e-mail address or the domain associated with the submitted e-mail address; or the natural person who is assigned the cell phone number by a carrier or wireless provider, as applicable. All entries submitted become the sole property of the Parties and will not be acknowledged or returned. Proof of submission of an entry shall not be deemed proof of receipt by the Parties. The Administrator’s computer is the official time keeping device for the Sweepstakes. Potential winners may be required to show proof of being the registered user of an account. Entries specifying an invalid, nonworking or inactive e-mail address will be disqualified and ineligible to win. Entries must be received no later than 11:59:59 pm ET on Sunday, September 10, 2017 in order to be eligible for a chance to win. 2. ELIGIBILITY: The Sweepstakes is open to all legal residents of the 48 contiguous United States and the District of Columbia (collectively, the “Sweepstakes Territory”), twenty-one (21) years of age or older at the time of entry. Employees, officers and directors (including their families and persons residing in the same household) of the Parties and of the Parties’ respective members, parents, subsidiaries, and affiliated companies, affiliate radio stations or their licensees, promotional agencies, independent contractors, program suppliers and advertising agencies are ineligible to enter or win the Sweepstakes (such persons, collectively, “Ineligible Parties”). The Sweepstakes is subject to all applicable federal, state, and local laws and regulations. Void in Alaska and Hawaii, and where prohibited. The Parties reserve the right to verify the eligibility of any entrant. Travel must occur between Thursday, September 21, 2017 and Monday, September 25, 2017 and travel must be booked within seven (7) days of being named the Winner.The inability to adhere to these Official Rules will result in forfeiture of the prize to that Winner. 3. RESTRICTIONS: The Parties and each of their respective parent organizations, subsidiaries, affiliates, officers, directors, shareholders, agents, representatives, employees, local radio station affiliates or their licensees, promotional agencies or independent contractors (the “Sponsoring Entities”) are not responsible for late, lost, misdirected, incomplete, undeliverable or destroyed entries, or for any: (i) hardware or software failures of any kind, (ii) lost or unavailable network connections, (iii) failed, incomplete or garbled computer or telephone transmissions, (iv) typographical or system errors and failures, (v) faulty transmissions, or (vi) problems or technical malfunction of any telephone network or lines, computer online systems, servers or providers, or computer equipment. The Sponsoring Entities are not responsible for any typographical or other errors in the offer or administration of the Sweepstakes, including, but not limited to, errors in the printing or posting of the offer or official rules, the selection and announcement of any winner, or the distribution of any prize. In addition, the Sponsoring Entities are not responsible for any entry not received by WWO on account of technical problems or traffic congestion on the Internet, the Website, or at any other website participating in theSweepstakes, or any combination thereof, including, without limitation, any injury (including personal injury) or damage to entrant's or any other person's personal property (e.g., computer) related to or resulting from playing the Sweepstakes (or downloading any material for the Sweepstakes) or other telecommunications malfunctions which may limit an entrant's ability to participate. Either Party may prohibit you from participating in the Sweepstakes or winning a prize, if, in its sole discretion, it determines you are attempting to undermine the legitimate operation of the Sweepstakes by cheating, hacking, engaging in deception or other unfair playing practices, or intending to annoy, abuse, threaten or harass any other players or representatives of the Sponsoring Entities. If the Sweepstakes is not capable of running as planned for any reason including, without limitation, infection by computer virus, bugs, tampering, unauthorized intervention, fraud, or any other causes beyond the control of the Parties, that corrupts or affects the administration, security, fairness, integrity or proper conduct of the Sweepstakes, the Parties reserve the right at their sole discretion to void any suspect entries and/or cancel, terminate, modify or suspend the Sweepstakes without prior notice or obligation to any entrant or other third party. In the event the Sweepstakes is suspended, terminated or canceled, winners may be randomly selected from all eligible, non-suspect entries received up to the date of such suspension, termination or cancellation. ANY ATTEMPT BY AN ENTRANT TO DELIBERATELY DAMAGE ANY WEBSITE PARTICIPATING IN THE SWEEPSTAKES (INCLUDING WWW.WESTWOODONE.COM AND THE WEBSITE) OR THE WEBSITE OF ANY PARTICIPATING LOCAL RADIO STATION AFFILIATE) OR UNDERMINE THE LEGITIMATE OPERATION OF THE SWEEPSTAKES MAY BE A VIOLATION OF CRIMINAL AND/OR CIVIL LAWS AND SHOULD SUCH AN ATTEMPT BE MADE, THE PARTIES RESERVE THE RIGHT TO SEEK REMEDIES AND DAMAGES (INCLUDING ATTORNEY'S FEES) FROM ANY SUCH ENTRANT TO THE FULLEST EXTENT OF THE LAW, INCLUDING CRIMINAL PROSECUTION. Entrants are required to provide truthful information and the Parties will reject and delete any entry that it discovers to be false or fraudulent. The Parties will disqualify any entry from individuals who do not meet the eligibility requirements and WWO will also delete any entry received from persons it discovers are under the age of 13 in compliance with the Children’s Online Privacy Protection Act. 4. SELECTION OF PRIZE WINNER: All qualifying entries in the Sweepstakes will be entered into one random prize drawing. One (1) potential winner, pending verification of eligibility and compliance with these official rules (referred to as the Winner”) will be selected by WWO at random on or around Monday, September 11, 2017 from all eligible entries received. The decisions of the Parties are final and binding in all respects. The Winner will be notified by phone, mail and/or e-mail. If WWO is unable to contact the Winner after a reasonable effort has been made during three (3) business days from the first notification attempt, or any prize notification is returned as undelivered, such Winner may be disqualified and an alternate potential Winner selected (and an alternate to the alternate as many times as may be necessary up to a maximum of five (5) alternates). Any prize will be awarded subject to verification of eligibility and compliance with these official rules and as long as all qualifications relating to the Sweepstakes are met. Odds of winning are based upon the total number of eligible entries received. This is a national multi-market sweepstakes in which all entrants will compete with other entrants, including the listeners of multiple radio stations in multiple markets throughout the United States during the Sweepstakes Period. 5. PRIZE: One (1) Winner will receive a four (4)-night trip for two (2) people (the Winner and a travel companion) to Las Vegas, Nevada to attend the Life is Beautiful Festival (nightly events on Friday, Saturday and Sunday, September 22 – 24, 2017). The “prize” consists of: (a) roundtrip coach class airfare for two (2) to Las Vegas, Nevada from a major airport near the Winner’s address (inclusive of taxes, tariffs and related fees) (subject to the next paragraph); (b) four (4)-nights’ hotel accommodations for the evenings of September 21, 22, 23, and 24, 2017 (based on double occupancy standard hotel room, inclusive of taxes); (c) two (2) three-day VIP tickets to the Life is Beautiful Festival (nightly event access on Friday, Saturday and Sunday, September 22 – 24, 2017) and (d) two (2) meet & greet passes for artist, Russ, on Friday, September 22, 2017 (Approximate Retail Value (“ARV”): $4,000).The prize components set forth in clauses (a)-(d) above must be enjoyed during the same trip and travel must occur between Thursday, September 21, 2017 and Monday, September 25, 2017. All travel must be taken on dates specified or prize will be forfeited and may be awarded to an alternate; no alternative travel dates are available.Elements of the prize are non-transferable.Travel must be booked within seven (7) days of being named the Winner.All prize components are subject to the terms and conditions of the vendors of such prize. All prize elements, including particular travel dates and arrangements, are based upon availability, substitutions may apply.Actual retail value may vary based on airfare fluctuations and the distance between the departure city and destination.All expenses not included as part of the prize (including without limitation, any Life is Beautiful festival expenses not described in the prize above, federal, state and local taxes, transportation between the Winner’s home and airport/hotel, meals, gratuities, luggage fees, and other incidental and travel-related charges and expenses) shall be the responsibility of the Winner.Neither the Winner nor Winner’s travel companion will be eligible to receive the difference, if any, between the stated prize amount set forth above and the actual cost of such prize.Once travel is booked, no changes or cancellations will be accepted. There are no extensions or exceptions. The Sponsoring Entities shall not be responsible for and assume no liability for cancellation or unavailability of flights or hotels. No portion of the prize can be redeemed for cash value, used in conjunction with any other promotion, or transferred. No substitution or transfer of prize is permitted except that WWO reserves the right to substitute a prize of equal or greater value in the event the offered prize (or a portion thereof) is unavailable. WWO may also make substitution(s) of equivalent kind and value if and when necessary. Travel arrangements will be determined by WWO. Winner and guest must travel on the same itinerary. Travel companion must be twenty-one (21) years old or older, unless Winner is traveling companion’s parent or legal guardian. Minors must be accompanied at all times during trip (including, but not limited to, in-flight, hotel stay and all prize-related events) by minor’s parent or legal guardian. Once travel guest is selected, he/she may not be substituted, except in WWO’s sole and absolute discretion. All travelers and companions must present valid identification prior to ticketing. Airline carrier’s regulations apply. Trip may not be combined with any other offer and travel may not qualify for frequent flyer miles. Airline tickets are non-refundable/non-transferable. Other restrictions may apply. All airline tickets are subject to flight variation, work stoppages, and schedule or route changes.If in the judgment of WWO, air travel is not required due to winner's proximity to Las Vegas, Nevada, ground transportation will be substituted for roundtrip air travel at WWO's sole and absolute discretion.The difference in value will not be awarded to the Winner.Neither Party shall be responsible for any cancellations, delays, diversions or substitution or any act or omissions whatsoever by the air carriers, hotels, venue operators, transportation companies, prize providers or any other persons providing any prize-related services or accommodations. Additional prize award details and travel information to be provided to the Winner at the time of notification.Winner and guest are also responsible for obtaining travel insurance (and all other forms of insurance) at their option and hereby acknowledge that the Parties have not and will not obtain or provide travel insurance or any other form of insurance.Lost, stolen or damaged tickets, travel vouchers or certificates will not be replaced or exchanged. The event opportunity portion of the prize will be awarded at the sole discretion of WWO, who retains the right to cancel or modify that portion of the prize due, without limitation, to time limitation, promotional or regulatory considerations, or other factors. An unforeseen change in event programming or other factors not directly related to the Sweepstakes may result in a change of time and/or place of the prize trip and possibly its cancellation, in which case a prize of at least equal value will be substituted if the prize shall have already been awarded. 6. WINNER NOTIFICATION; CONDITIONS: Winner will be notified by phone, and/or e-mail. By entering the Sweepstakes, entrants are agreeing they meet the eligibility requirements stated in these official rules and they are not an Ineligible Party as that term is defined in Section 2 of these official rules. The Winner and the Winner’s traveling companion will be required to sign and return, as applicable, an affidavit of eligibility, a liability release and, a travel liability release provided by the Parties within three (3) days of notification and, as may be required, at the Parties’ discretion, to complete and sign other forms pertaining to the Sweepstakes before the prize is awarded. In the event any such signed forms are not received by WWO within the specified time period, WWO reserves the right to choose an alternate winner by random selection. The affidavit of eligibility and the liability and travel liability releases serve to, among other things, confirm eligibility and release the Sponsoring Entities from any and all harm, injury or liability of any kind that may result in connection with participation in the Sweepstakes, the acceptance, use, misuse, possession, loss or misdirection of the prize, including without limitation any travel related thereto, or any typographical or other error in the printing, offering or announcement of any prize. Any person winning over $600.00 in prizes from WWO will receive an IRS Form 1099 from WWO for the calendar year in which the prize is awarded for the value for the value of the prize and a copy of such form will be filed by WWO with the IRS. All federal, state, and local taxes and any expenses not expressly provided for in these official rules are solely the responsibility of the Winner. Except where prohibited by law, the Winner’s entry and Winner’s and Winner’s traveling companion’s acceptance of the prize constitutes Winner’s and Winner’s traveling companion’s permission to the Sponsoring Entities to use the Winner’s and the Winner’s traveling companion’s name, photograph, likeness, statements, biographical information, voice, and address (cityand state) for advertising and promotional purposes worldwide and in all forms of media, in perpetuity, without further compensation and is deemed a certification that such entrant meets the eligibility requirements of the Sweepstakes as listed in these official rules and is not an Ineligible Party. BY ENTERING THE SWEEPSTAKES, PARTICIPANTS RELEASE AND HOLD HARMLESS THE SPONSORING ENTITIES FROM ANY AND ALL LIABILITY OR ANY INJURIES, LOSS OR DAMAGE OF ANY KIND ARISING FROM OR IN CONNECTION WITH THE SWEEPSTAKES OR ANY PRIZE WON. Entrants agree that all entries become the property of the Sponsoring Entities and none will be acknowledged or returned. 8. SWEEPSTAKES PROVIDED “AS IS”: THE WINNER, THE WINNER’S TRAVELING COMPANION, AND ENTRANTS AGREE THAT THE SPONSORING ENTITIES SHALL NOT BE RESPONSIBLE OR LIABLE FOR, AND EACH WINNER AND ENTRANT AGREES TO RELEASE THE SPONSORING ENTITIES FROM, LOSSES, DAMAGES, OR INJURIES OF ANY KIND TO PERSONS, INCLUDING PERSONAL INJURY OR DEATH, OR PROPERTY RESULTING FROM PARTICIPATING IN THE SWEEPSTAKES OR SWEEPSTAKES-RELATED ACTIVITY INCLUDING, BUT NOT LIMITED TO, THE ACCEPTANCE/POSSESSION AND/OR USE/MISUSE OF ANY PRIZE AND/OR ANY INJURY OR DAMAGE TO ENTRANT'S OR THIRD PERSON'S PROPERTY RELATED TO OR RESULTING FROM ANY PRIZE OR ANY PART OF THE SWEEPSTAKES, INCLUDING WITHOUT LIMITATION ANY TRAVEL RELATED THERETO. BY PARTICIPATING IN THE SWEEPSTAKES, ENTRANTS AGREE THAT SPONSORING ENTITIES WILL HAVE NO LIABILITY WHATSOEVER FOR, AND THAT ENTRANT SHALL HOLD SPONSORING ENTITIES HARMLESS AGAINST, ANY LIABILITY FOR ANY CLAIMS BASED ON PUBLICITY RIGHTS, DEFAMATION, INVASION OF PRIVACY, OR MERCHANDISE DELIVERY. BY PARTICIPATING IN THE SWEEPSTAKES, PARTICIPANTS AGREE THAT SPONSORING ENTITIES WILL NOT BE RESPONSIBLE OR LIABLE FOR ANY INJURIES, DAMAGES, OR LOSSES OF ANY KIND, WHETHER OR NOT FORESEEABLE, INCLUDING, WITHOUT LIMITATION, DIRECT, INDIRECT, INCIDENTAL, CONSEQUENTIAL, OR PUNITIVE DAMAGES TO PERSONS, INCLUDING DEATH, OR TO PROPERTY ARISING OUT OF ACCESS TO AND USE OF INTERNET WEBSITES USED IN THE SWEEPSTAKES (WWW.WESTWOODONE.COMTHE WEBSITE, AND THE WEBSITE OF ANY PARTICIPATING LOCAL RADIO STATION AFFILIATE) OR THE DOWNLOADING FROM AND/OR PRINTING MATERIAL DOWNLOADED FROM THE AFOREMENTIONED SITES. WITHOUT LIMITING THE FOREGOING, EVERYTHING REGARDING THE SWEEPSTAKES, INCLUDING ANY WEBSITES USED IN CONNECTION THEREWITH AND ANY PRIZE AWARDED HEREUNDER, ARE PROVIDED “AS IS” WITHOUT WARRANTY OF ANY KIND, EITHER EXPRESS OR IMPLIED, INCLUDING BUT NOT LIMITED TO, THE IMPLIED WARRANTIES OF MERCHANTABILITY, FITNESS FOR A PARTICULAR PURPOSE, OR NON-INFRINGEMENT, ALL OF WHICH ARE EXPRESSLY DISCLAIMED BY THE SPONSORING ENTITIES. SOME JURISDICTIONS MAY NOT ALLOW THE LIMITATION OR EXCLUSION OF LIABILITY FOR INCIDENTAL OR CONSEQUENTIAL DAMAGES OR EXCLUSION OF IMPLIED WARRANTIES, SO SOME OF THE ABOVE LIMITATIONS OR EXCLUSIONS MAY NOT APPLY. CHECK LOCAL LAWS FOR ANY RESTRICTIONS OR LIMITATIONS REGARDING THESE LIMITATIONS OR EXCLUSIONS. Entrants further understand and agree that all rights under Section 1542 of the Civil Code of California (“Section 1542”) and any similar law of any state or territory of the United States that may be applicable with respect to the foregoing release are hereby expressly and forever waived.Entrants acknowledge that Section 1542 provides that: “A GENERAL RELEASE DOES NOT EXTEND TO CLAIMS WHICH THE CREDITOR DOES NOT KNOW OR SUSPECT TO EXIST IN HIS OR HER FAVOR AT THE TIME OF EXECUTING THE RELEASE, WHICH, IF KNOWN BY HIM OR HER MUST HAVE MATERIALLY AFFECTED HIS OR HER SETTLEMENT WITH THE DEBTOR.”The releases hereunder are intended to apply to all claims not known or suspected to exist with the intent of waiving the effect of laws requiring the intent to release future unknown claims. 9. Binding Arbitration: Any controversy or claim arising out of or relating to this Sweepstakes shall be settled by binding arbitration in a location determined by the arbitrator as set forth herein (provided that such location is reasonably convenient for claimant), or at such other location as may be mutually agreed upon by the parties, in accordance with the procedural rules for commercial disputes set forth in the Comprehensive Arbitration Rules and Procedures of JAMS (“JAMS Rules and Procedures”) then prevailing, and judgment upon the award rendered by the arbitrator(s) may be entered in any court having jurisdiction thereof. The arbitrator shall be selected pursuant to the JAMS Rules and Procedures. The arbitrator shall apply New York law consistent with the Federal Arbitration Act and applicable statutes of limitations, and shall honor claims of privilege recognized at law. In the event that the claimant is able to demonstrate that the costs of arbitration will be prohibitive as compared to the costs of litigation, Sponsor will pay as much of the claimant’s filing and hearing fees in connection with the arbitration as the arbitrator deems necessary to prevent the arbitration from being cost-prohibitive. If any part of this arbitration provision is deemed to be invalid, unenforceable or illegal (other than that claims will not be arbitrated on a class or representative basis), or otherwise conflicts with the rules and procedures established by JAMS, then the balance of this arbitration provision shall remain in effect and shall be construed in accordance with its terms as if the invalid, unenforceable, illegal or conflicting provision were not contained herein. If, however, the portion that is deemed invalid, unenforceable or illegal is that claims will not be arbitrated on a class or representative basis, then the entirety of this arbitration provision shall be null and void, and neither claimant nor Sponsor shall be entitled to arbitrate their dispute. Upon filing a demand for arbitration, all parties to such arbitration shall have the right of discovery, which discovery shall be completed within sixty days after the demand for arbitration is made, unless further extended by mutual agreement of the parties.THE ARBITRATION OF DISPUTES PURSUANT TO THIS PARAGRAPH SHALL BE IN THE ENTRANT’S INDIVIDUAL CAPACITY AND NOT AS A PLAINTIFF OR CLASS MEMBER IN ANY PURPORTED CLASS OR REPRESENTATIVE PROCEEDING. THE ARBITRATOR MAY NOT CONSOLIDATE OR JOIN THE CLAIMS OF OTHER PERSONS OR PARTIES WHO MAY BE SIMILARLY SITUATED.DO NOT ENTER THIS SWEEPSTAKES IF YOU DO NOT AGREE TO HAVE ANY CLAIM OR CONTROVERSY ARBITRATED IN ACCORDANCE WITH THESE OFFICIAL RULES. BY PARTICIPATING IN THE SWEEPSTAKES, EACH ENTRANT AGREES THAT TO THE EXTENT PERMITTED BY APPLICABLE LAW: (1) ANY AND ALL DISPUTES, CLAIMS AND CAUSES OF ACTION ARISING OUT OF OR CONNECTED WITH THE CONTEST, OR ANY PRIZE AWARDED, WILL BE RESOLVED INDIVIDUALLY THROUGH BINDING ARBITRATION AS SET FORTH ABOVE, WITHOUT RESORT TO ANY FORM OF CLASS ACTION AND (2) ENTRANT'S REMEDIES ARE LIMITED TO A CLAIM FOR MONEY DAMAGES (IF ANY) AND ENTRANT IRREVOCABLY WAIVES ANY RIGHT TO SEEK INJUNCTIVE OR EQUITABLE RELIEF. SOME JURISDICTIONS DO NOT ALLOW THE LIMITATIONS OR EXCLUSION OF LIABILITY SET FORTH ABOVE, SO SUCH LANGUAGE MAY NOT APPLY TO EVERY ENTRANT. 10. Governing Law & Jurisdiction: This Sweepstakes and these official rules are governed by US law and are subject to all applicable federal, state and local laws and regulations. All issues and questions concerning the construction, validity, interpretation and enforceability of the Sweepstakes, the official rules, or the rights and obligations of entrants and the Parties in connection with the Sweepstakes, shall be governed by, and construed in accordance with, the laws of the State of New York, U.S.A., without giving effect to the conflict of laws rules thereof, and any matters or proceedings which are not subject to arbitration as set forth in Section 9 of these official rules and/or for entering any judgment on an arbitration award, shall take place in New York City. 11. For the name of the Winner or a copy of these official rules, send a self-addressed stamped envelope to “Winner” or “Official Rules” (specify which) c/o LIFE IS BEAUTIFUL SWEEPSTAKES, 220 West 42nd Street, New York, NY 10036. All such requests must be received by Friday, October 13, 2017, to receive a response. 12. By use of the Website and by entering the Sweepstakes, you agree to the Terms of Service located at www.westwoodone.com/Legal/Terms-of-Use and to the use of your personal information as described in the Privacy Policies located at https://www.toyota.com/support/privacy-rights and www.westwoodone.com/Legal/Privacy-Policy. If you are selected as the Winner, your information may also be included in a publicly-available winner’s list.